The series "Classics of the Brazilian Choro – You are the Soloist!" enables you to discover the Choro style through the incomparable experience of performing the compositions yourself, accompanied by a Choro Ensemble. 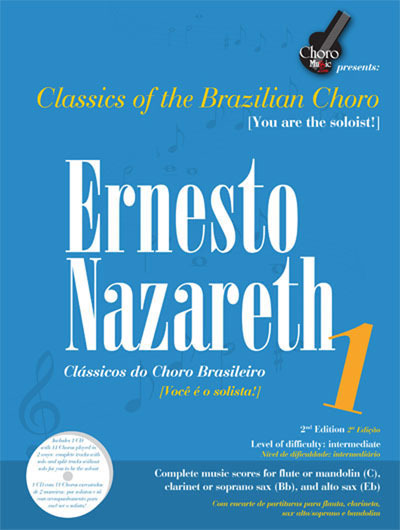 Each volume of the series features a famous composer of this amazing music style, including his/her main compositions in a digitally-mastered audio CD and a high-quality printed music book with the corresponding C, Bb and Eb scores, as well as interviews, biography, and relevance of the author to the history of Choro. Using the CD, listen to the complete stereo tracks (with soloists) for your reference. Tune your instrument (flute, sax, clarinet or mandolin) using the tuning notes. Now have fun being the soloist, using the accompaniment tracks featuring a leading Choro Ensemble from Brazil. Now you can play along with your own "Choro Ensemble," which will always be there for you, whether at home, on the road or at the beach. This work has an additional feature: if you are learning or already play the 6-string guitar or cavaquinho, and wish to replace one of the two instruments by playing yourself, use the C-score along with the respective harmonies provided for that purpose. Have fun and good training! The book I ordered arrived very fast and well packaged , everything was perfect. I would repurchase from that store for sure (I play baritone sax so I am not really the target for guitar and strings book generally but the book I purchased have the chart in Eb in it) But I would recommend that store to anyone.